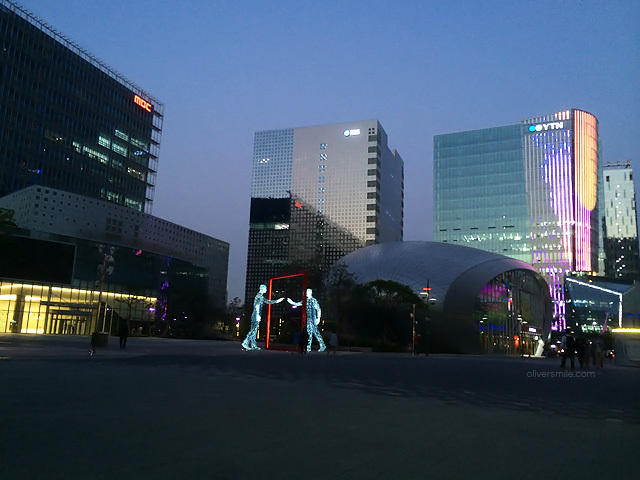 This was where we stayed near during our week long vacation in Seoul. 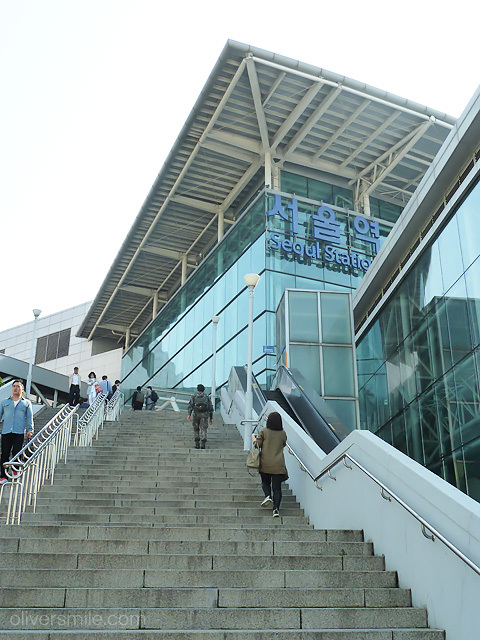 It’s a huge station since it connects the main railway lines. 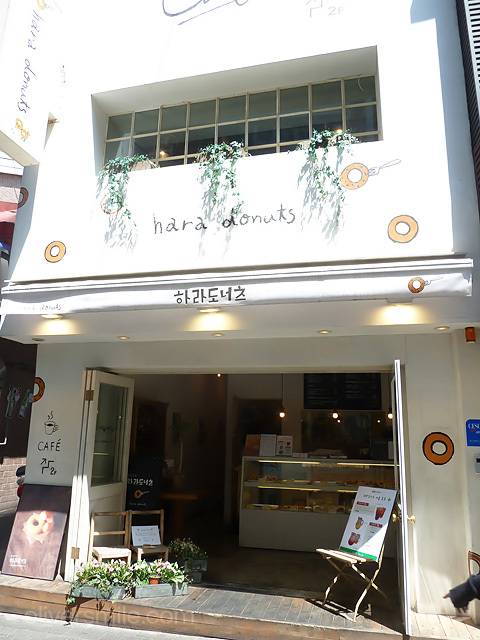 Our first breakfast in Seoul was here: I realized most of their bakeries have seating areas so it doubles up as a cafe as well. 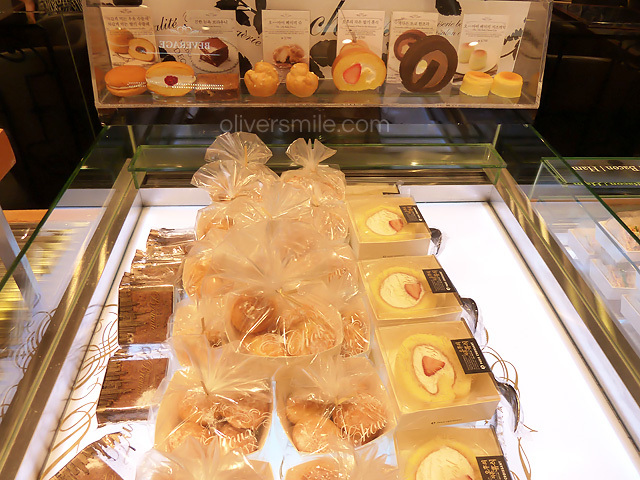 We bought this small box of almond bread biscuits and the staff wrapped it up nicely in a plastic carrier. The meticulous packaging reminded me of Japan. The bread was dry and bland though. 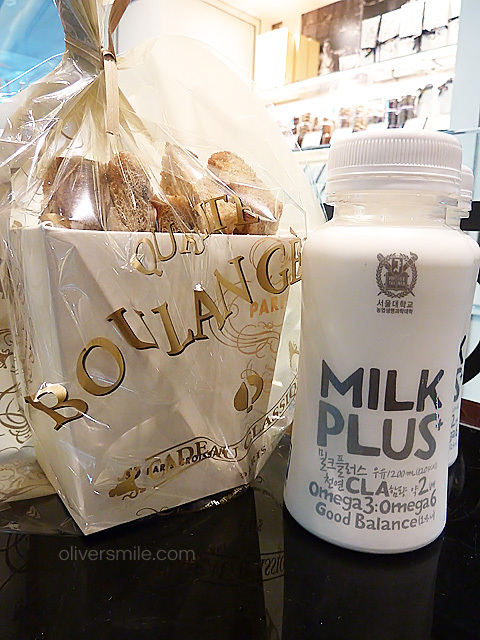 The milk tasted slightly better, also a tad different from brands we’re used to in Singapore. 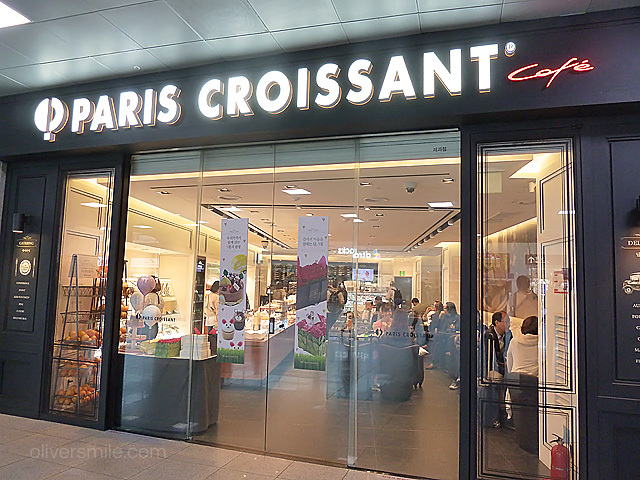 Incidentally, walking downwards toward the subway is another bakery chain with a similar name, Paris Baguette. I had better results there ‘cos the bread I selected tasted much, much better. Expect more cafe reviews in my following posts, since Seoul is pretty much littered with them and you’ll be spoiled for choice! 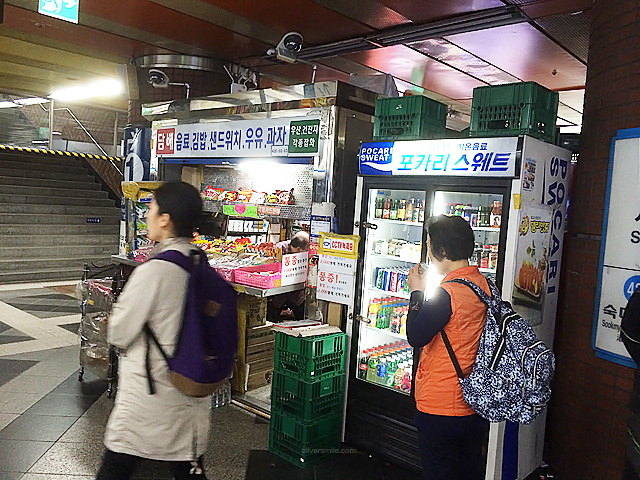 Grabbed some drinks at the nearby Lotte Mart before we headed for Myeongdong. 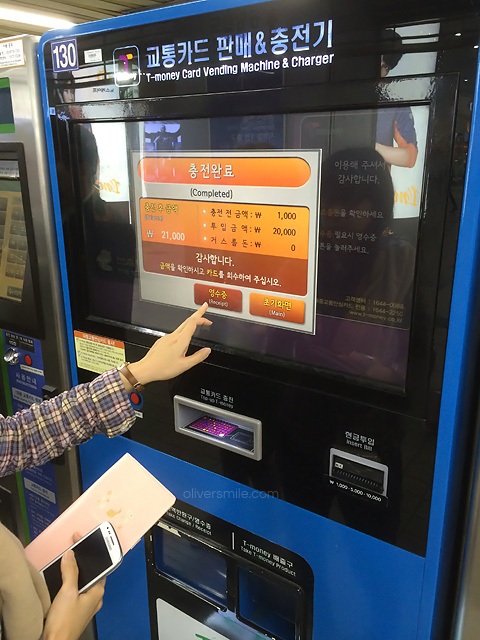 As the amount we paid for the T-money card at the airport mostly went to its deposit, we topped up more money at the subway station. 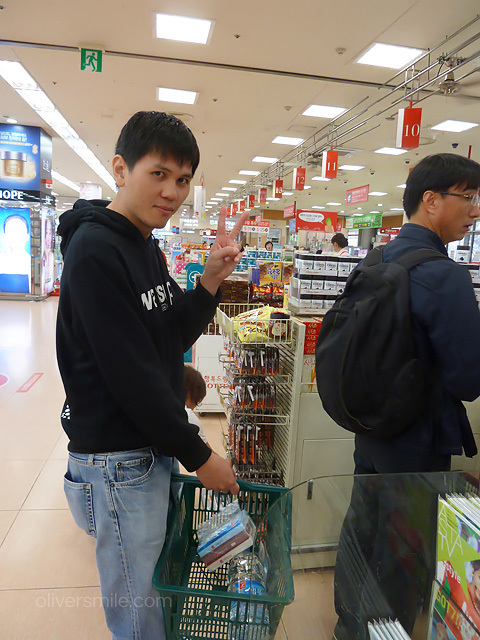 The vending machines conveniently provides English service so the transaction was a breeze. 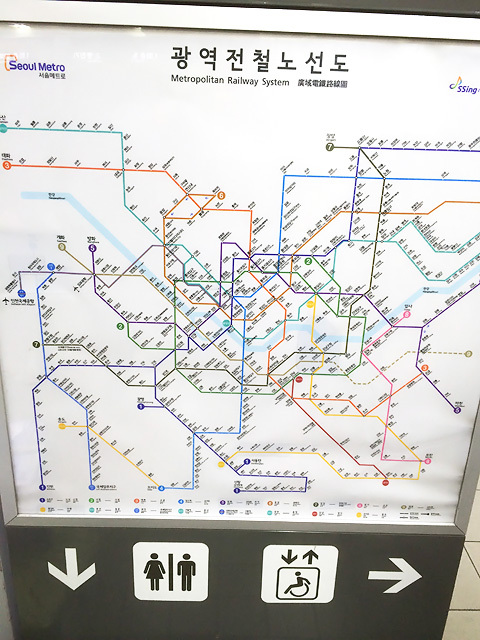 Not gonna lie, the railway map was pretty confusing for first timers. It took us about 2-3 days to get used to it. Good news is? You’ll survive. 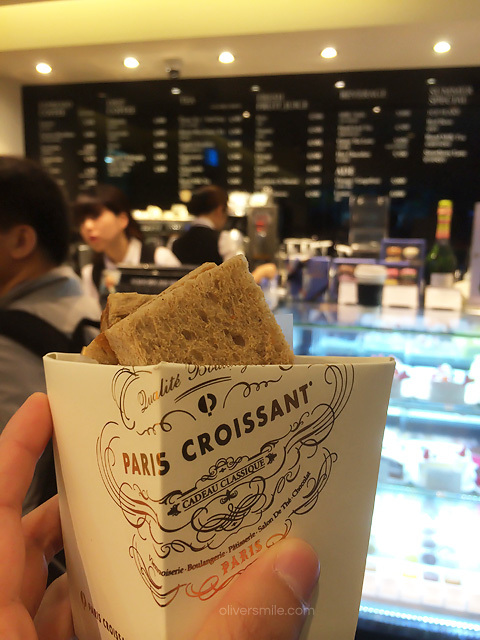 One of the biggest difference in their train stations as compared to Singapore, is that you can eat inside. Not that we saw many people eating, but it’s nice to know you don’t have to be secretive about it. If you’re into Korean music and want to buy some cds, you’ll find better deals in the underground mall at Myeongdong station before coming up to the street level. I didn’t take any pictures, but there’s two music stores located separately on the left and right lane in the underground station, the minute you come out of Myeongdong exit 5/6. 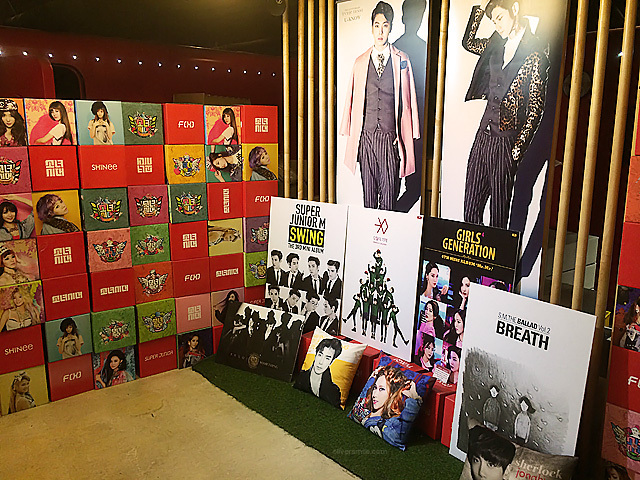 For the same CD selling at $12400 krw here, it’s sold at $13000 elsewhere. 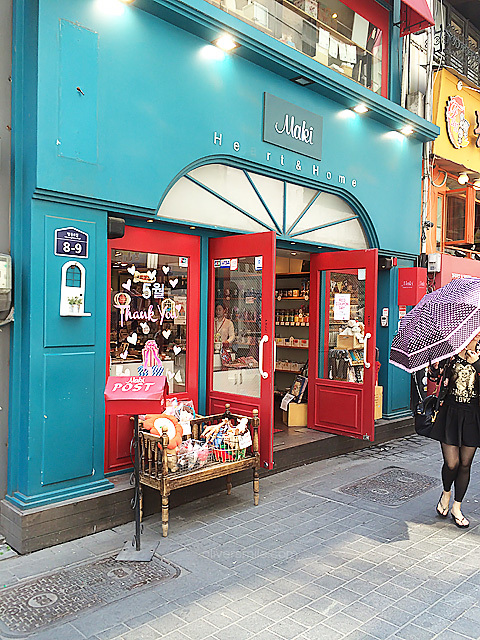 Myeongdong definitely lives up to its name of being a cosmetic street because you see them smacked everywhere. 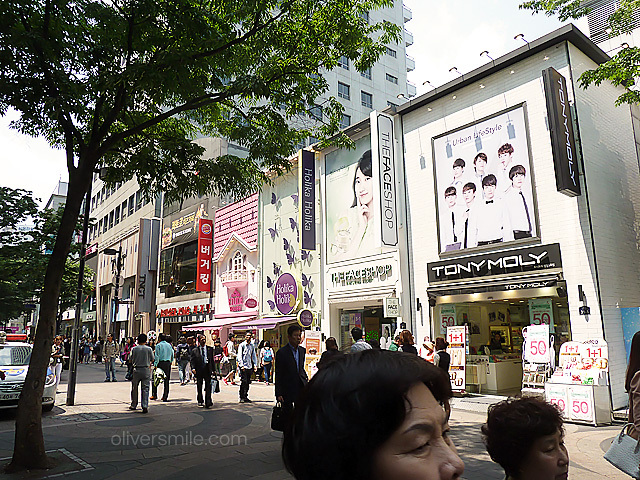 I saw at least 3-4 branches of Nature Republic, Etude House, Holika Holika, Tony Moly etc in different parts of the streets. And like what you probably read in other blogs, everytime you buy something, they will give you some freebies. They call this “service” in Korea. Hit more than $30,000 krw, you get a tax rebate slip. 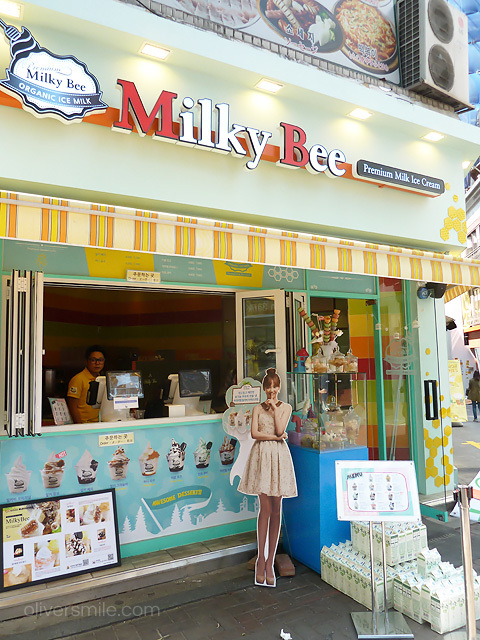 As expected for a tourist site, Myeongdong has many foreign language speaking staff. Interestingly, there’s more Mandarin than English speaking staff. 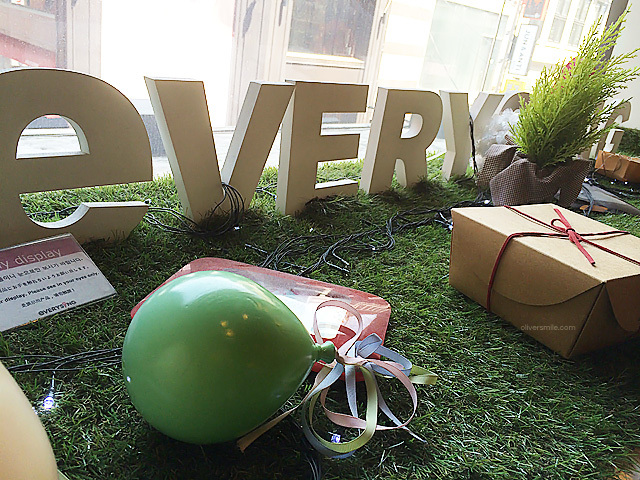 We dropped by EverySing, a shop owned by SM entertainment company featuring celebrity merchandise, a karaoke studio and sticker photo booths. I’m not a SM fan, but like what I told K, if I could ever get hold of how they do their marketing, I’d be thrilled. These people know their stuff, and they do it well. We mostly just walked around ‘cos we heard things will be cheaper in Edae. 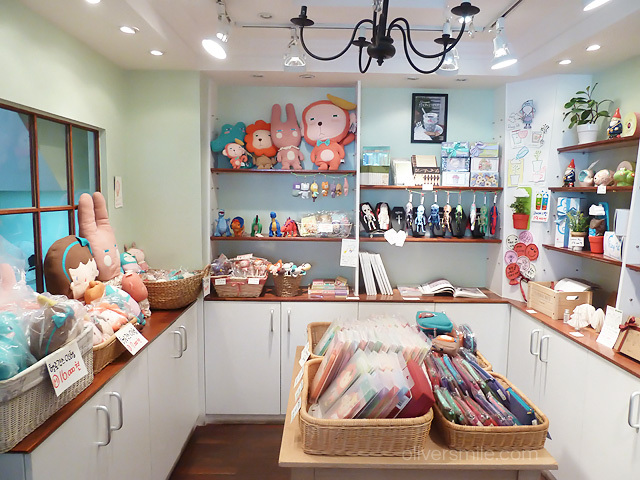 Well, that’s partly true, but if you see something you really like in Myeongdong, just get it. 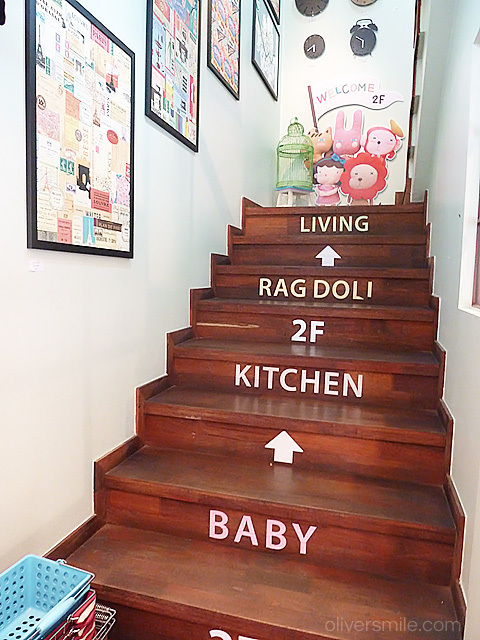 Came across this absolutely darling shop but the doll I wanted to get doesn’t cost much different in Singapore so I hesitated. I’m glad I did, ‘cos we got it cheaper in the end at Nandaemun. It’s kinda cool in the mornings during the times we were there in May, the temperature rising in the afternoon (can get quite warm) and then dropping to almost chilly in the night. And during the night, you encounter guys emitting alcoholic smells from their slightly inebriated bodies. 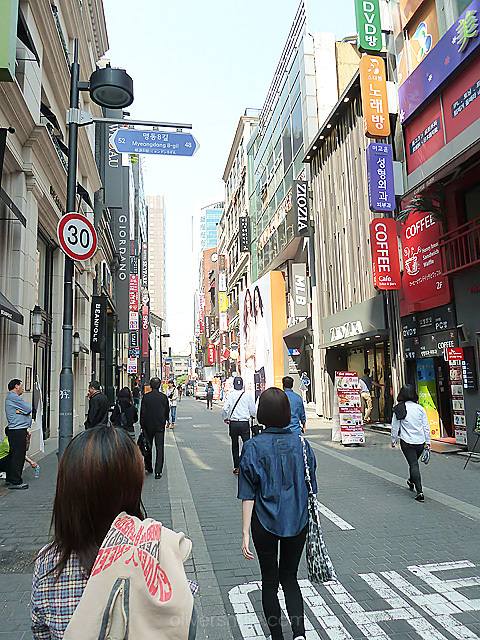 After strolling around, we went for lunch at Myeongdong Kyoja. 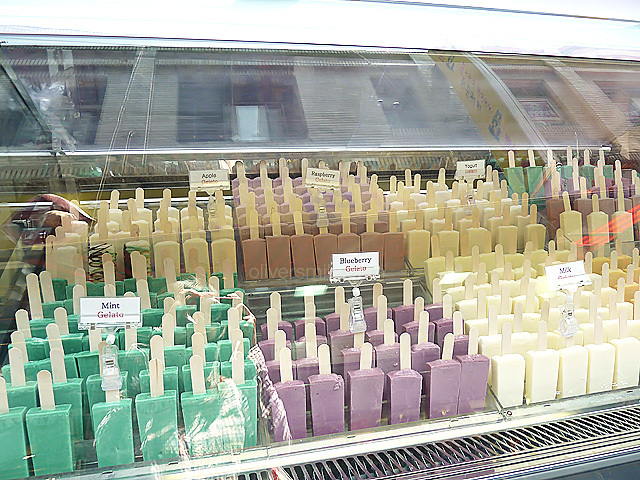 In Seoul, there’s a few places known for their food, something like Katong for laksa, Balestier for bah kut teh etc. 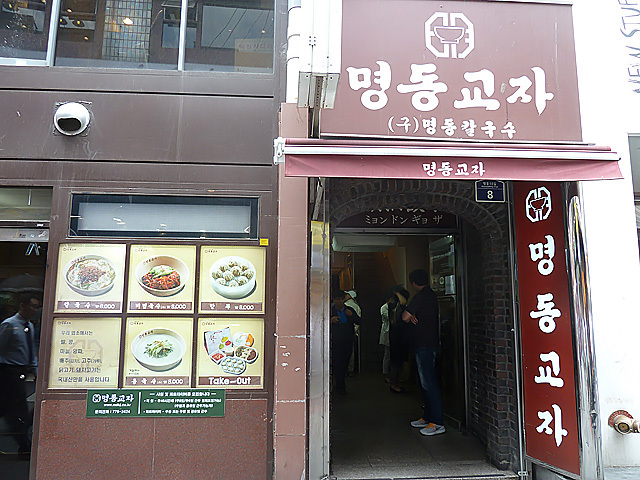 For Myeongdong, it’s knife noodles, if you go to Namsan, people will ask you to try pork cutlet, and Shinsa-dong, ddeobokki. The place was teeming with locals and tourists alike. 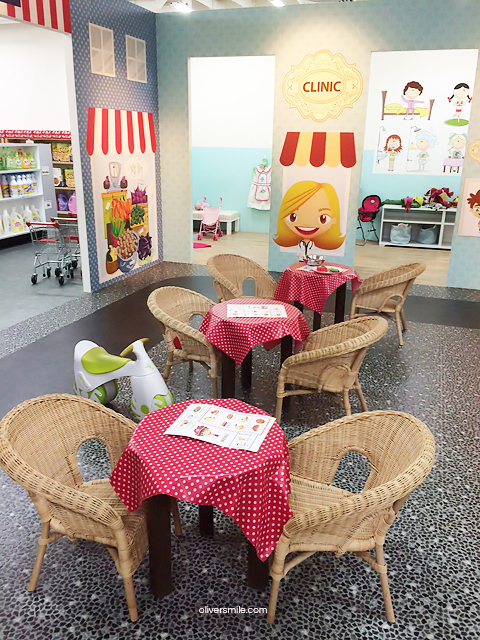 We had Korean speaking on our left and Cantonese dialect on our right. The ordering was quirky as well. An ahjumma asked us what we wanted and gave us a recipt straight away. It turned out their recipts were already printed way beforehand ‘cos there’s only a few items on the menu and you’d get the same combination anyway. 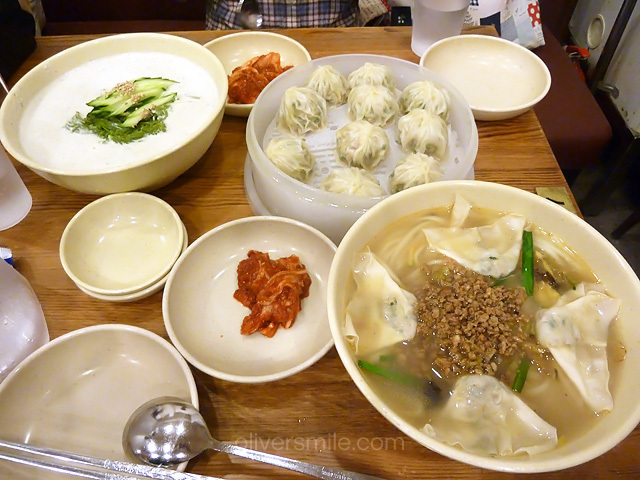 We ordered a soybean paste cold noodles and their signature knife noodles with dumplings. Wayyyy too much but we wanted to try everything! Even for a non-dumpling fan, I thought the gyoza noodles tasted delicious. The soybean noodles was refreshing, somewhat sweet and cold. But if you’re going in a pair, my advice would be to skip the soybean noodles and dumplings and just go for the gyoza noodles. It’s about 8000 krw each and the portions are big! Wandered around somemore with a full tummy. 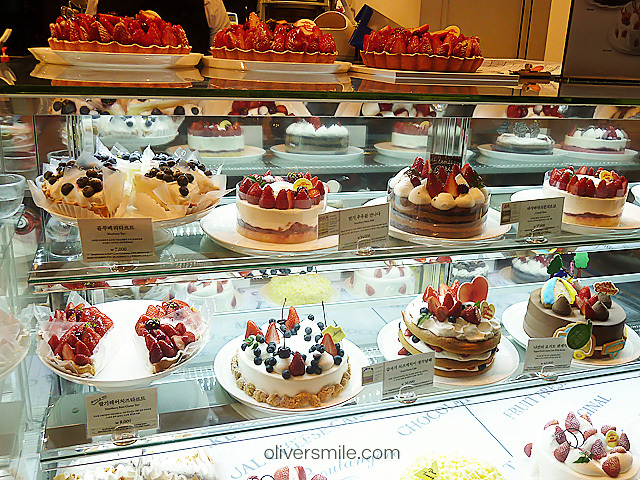 And we settled for dessert here. 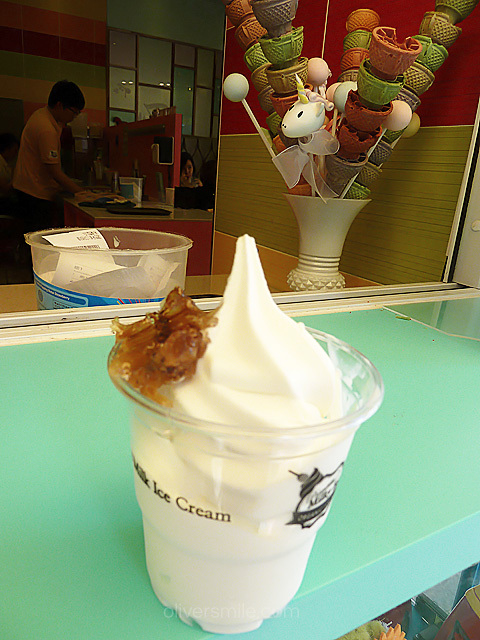 It’s organic milk ice-cream and I got the honey comb flavor. 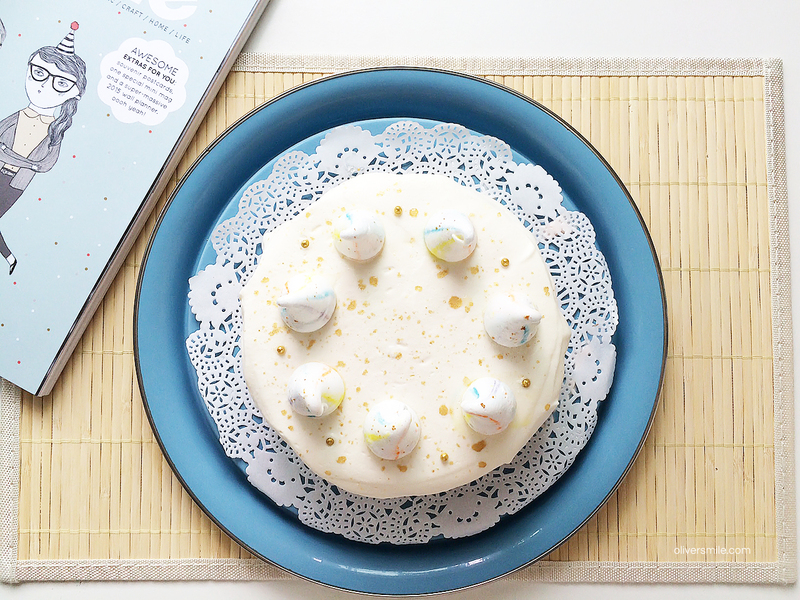 The taste was light and not too sweet. 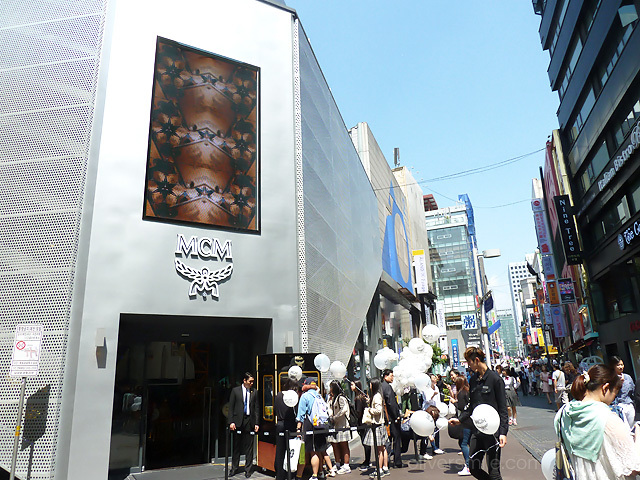 If you want to try it, it’s right next to the MCM store in Myeongdong. Coincidentally, I think we caught it at it’s opening. There’s people queueing up to go in and some girls were taking pictures with the tall usher. 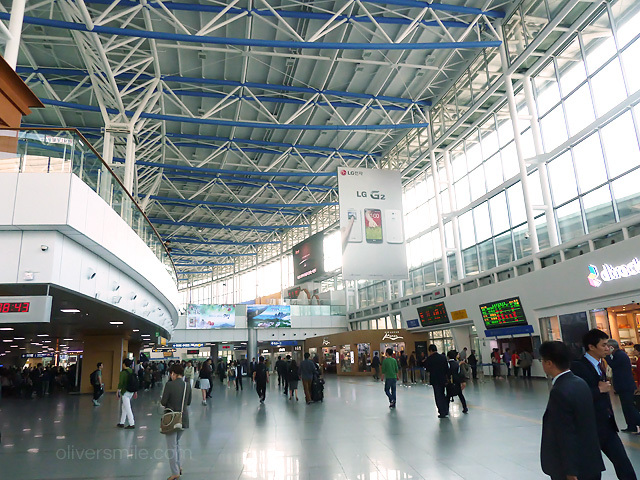 The thing in Korea is that, if you have the height, it magically makes you 100 times more attractive. I don’t really know why. 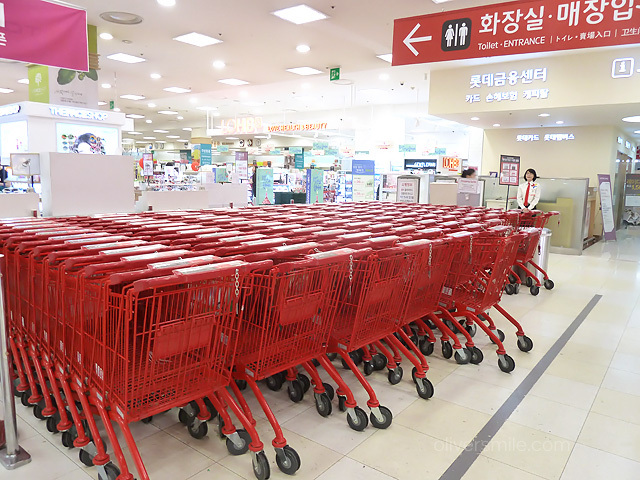 We made the mistake of going to Namdaemun market next. 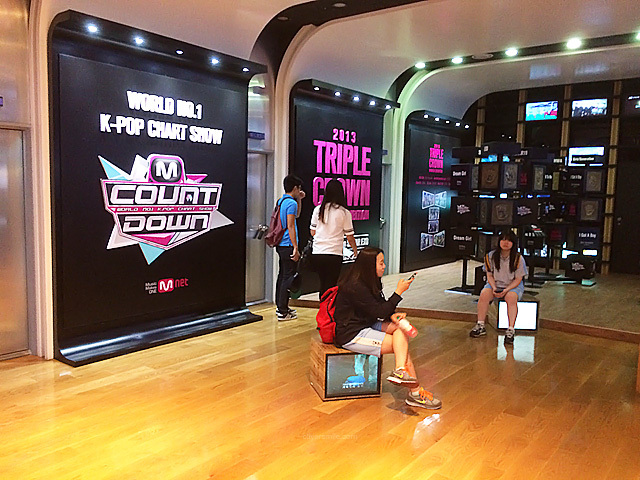 Originally, our stipulated stop was CJ E&M for the Mcountdown music show after a short break in our apartment. 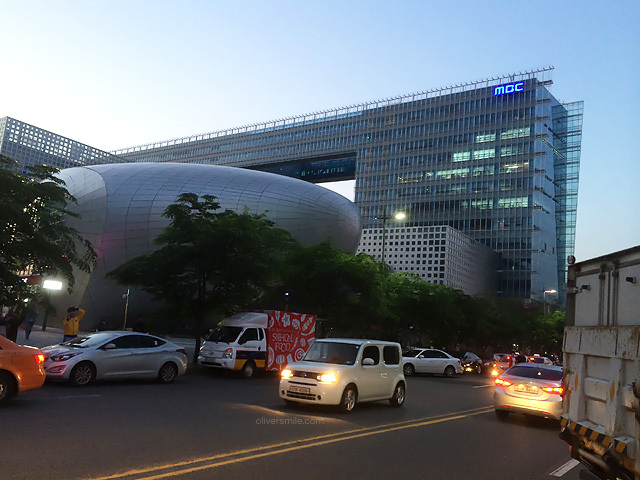 But we hadn’t bought much and I thought we could make a quick run to Namdaemun as it’s next to Myeongdong. What we overlooked was that the market was very big, and guess what? I noted the wrong timing for the show. We were supposed to gather at 4 pm for the Mnet TV station tour and then view the live show at 6. But I thought it was 5 pm and by the time we left the market, it was already 4+. We subsequently got lost in the subway station, fumbled with the door to our apartment and when we realized the mistake, it was already 5+. Added to that, the taxi driver didn’t know the place and we circled around a bit before he got us to the right location. In the midst of chaos, we saw G.na and a few other artistes up close as they were walking around before the show and most of the fans were already inside the venue. 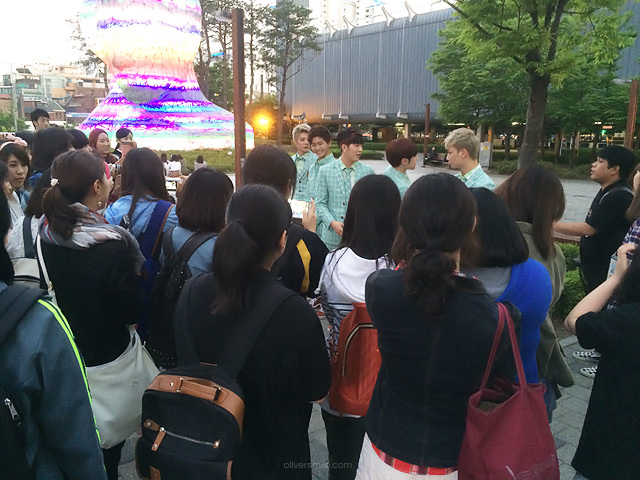 But I couldn’t concentrate on ogling G.na ‘cos the tour group was already far gone and we didn’t know where to go. In the end, we made an emergency international call to the person in charge and fortunately, she was still able to get us in though we were very far from the stage. This was when I wished I’ve an extra 10 cm to my height… Well at least K had a better view. 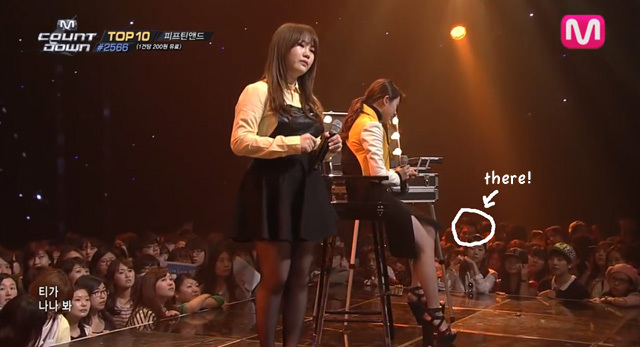 I felt so out of place in the crowd ‘cos there’s so many young screaming fan girls around me and it didn’t help that I don’t know most of the boy and girl groups. Thank God K was there to snicker with me. My favorite group didn’t perform live as they already pre-recorded their session and I was sooooo disappointed. 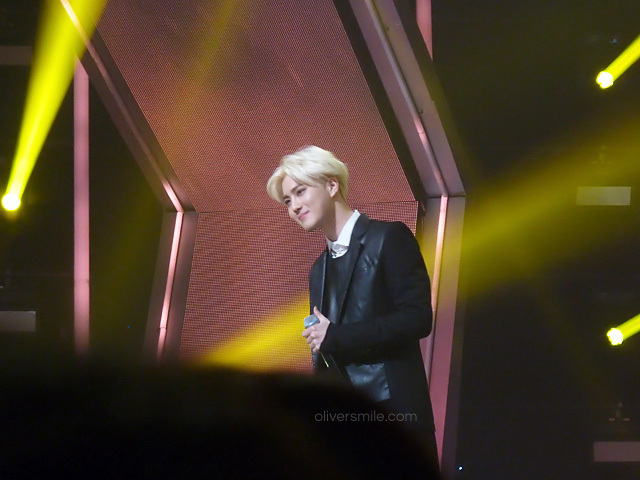 But Suho, their leader, appeared for the ending award ceremony and well, it’s a small consolation, I guess. He looked so skinny and the mother in me was itching to feed him, lol. If you’re interested in attending music shows like Mcountdown, Dream concert etc, you can book through this site called Trazy. The price is in USD and if you’re into this kinda thing, it’s quite an experience. One of the boy groups was holding a fan meeting outside the station but we didn’t stick around as I don’t know them and their song didn’t catch my fancy. It was cool by the time we came out and the place was rather nice to just hang out. Free wifi to boot. Instead of finding dinner here though, we opted to return somewhere near our apartment to eat. If you thought that’s the requiem to the series of unfortunate events for my Korea trip, you’re wrong. We walked to the train station but waited for half an hour to no avail. I was so tired and frustrated at it all that I cried. It was a stupid thing to cry about but the perfectionist in me had wanted this to be a smooth sailing trip and up til this point, it was anything but. Everything, from the little incidents here and there, to my bleeding nose (I was not used to the dry climate), compounded to this ball of vexation that I just had to let out. And you know what? As I was rubbing away my tears, my contact lens disappeared into the side of my left eye and my vision literally blurred. K coaxed me to take a taxi back and we ate some take outs from Lotte mart. 1. We actually did get to watch Mcount down live. 2. The taxi driver took us to the right place- my friend was telling me alot of drivers don’t like to ferry you to the exact location ‘cos they think a little walking won’t kill you. 3. I managed to fish the missing contact lens out from my left eye. 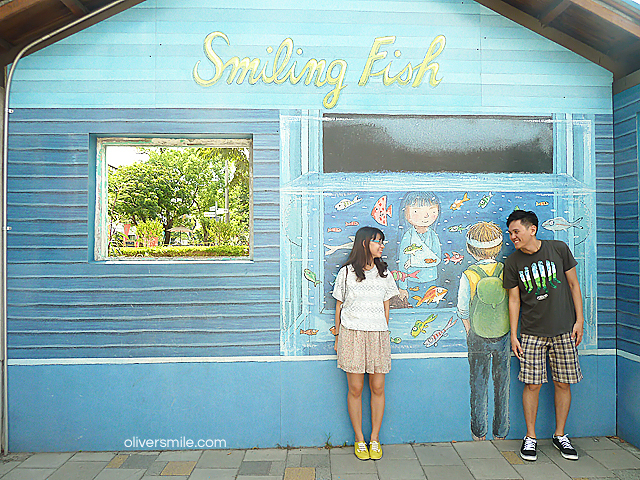 Click here to see the rest of our Korea trip’s experience.